In this part of the website we feature information on Italian Cuisine in general and the varied cuisine that can be found in the twenty different regions of Italy. In 'Authentic Italian Recipes' we have a selection of delicious, authentic Italian recipes sourced from different parts of the country. In 'Adapted Italian Recipes' we have a selection of recipes based on traditional Italian values, but adapted for an international palate, and using ingredients that are commonly available around the world. In our 'Guest Recipe' section, we feature recipes sourced from cookery experts and enthusiastic cooks from inside Italy and around the world. Italian food is known and loved all around the globe and there is hardly a city in the world that does not have an Italian restaurant or two. Supermarkets are full of italian ingredients from fresh cheeses and meats to pasta, tomato sauces, passata and pizza. Endless cookery books in many different languages are devoted solely to Italian cooking. But for an Italian cook, having the right pans is just as important as the ingredients. True Italian food is actually very simple and made only from fresh ingredients that are in season. Rarely do meals have heavy sauces or spices to mask the taste of the fresh produce. A typical Italian meal is fairly rigid in construction and the four courses are what you would expect to get in any local restaurant. The meal starts with 'antipasto' which usually consists of local meats and cheeses but on special occasions will be an endless stream of tasty little dishes made mainly from vegetables and sometimes fish. In addition to sun dried tomatoes, olives and grilled aubergines vegetables are stuffed and baked, courgette flowers are stuffed and fried and frittata, bruschetta, and small tarts come in varying sizes and combinations. This is all eaten with freshly baked, crusty homemade bread. Then comes the 'primo' or pasta course which is also eaten with bread. All the carbohydrates are consumed first leaving the protein to be eaten on its own in the next course. The 'secondo' is a piece of fresh meat or fish which will have been simply grilled and is served with lemon. This will be accompanied with either cold, grilled vegetables dribbled with olive oil or a simple salad with olive oil and salt. In some parts of Italy there may also be fried potatoes. The fourth course is 'dolce' which means sweet. Alternatively, there's a selection of fresh fruits in season but for special events or large gatherings plates of little cakes from the local bakers will be eaten too. All of this is washed down with jugs of local wine and plenty of water. The meal finishes with a cup of good, strong, Italian coffee followed by a glass of grappa (usually only the men) or another digestivo such as limoncello, ameretto, mirto or a liquer which is a speciality of the region. This may all seem like rather a lot of food but you need to remember that meals of this type last for around four hours. There are long gaps inbetween the courses with lots of chatting, playing with children and generally just enjoying the event. No one is in a hurry and the food is simple to prepare leaving everyone free to join in. In Italy, things are changing, particularly in the north, but traditionally, food and the eating of it is a family affair. Entertaining friends at home is not the normal way of life and daily meals are for the immediate family with Sunday being reserved for larger family gatherings. In the south, little has changed and the meal structure and the food itself remain untouched. The long lunch hour, often up to four hours, still exists and the main meal of the day is eaten at this time. During the week it is usual to only have two courses but on Sunday or other special occasions the full four courses will be enjoyed by an extended family. Due to the fact that Italy is a relatively new country and the individual regions had little contact with each other before this the food is very different from one region to the next. Added to this there is the geography, Italy is a long, narrow country with vast areas being very mountainous. The northern regions share a border with France, Switzerland, Austria and Slovenia, all of which greatly affect the cuisine. In the south, particularly in Sicily, the proximity of Africa and the warmer climate means that more exotic products can be grown and the local foods are spicier than elsewhere in Italy. All along the coast fish is the main diet, but inland, particularly in the mountains, meat is the staple diet, particularly pork, lamb and goat. It is also very general for Italians to only eat and cook with what can be grown locally which also adds to the diversity of the recipes. In each region there is a local pride in their own products, mixed with quite a lot of reluctance to try food from any of the other regions, even if it is only a few kilometres across the border. Italians like to eat what they are used to and that is that, nothing will make them try anything different. Fans of Mary Ann Esposito’s groundbreaking PBS cooking show CIAO ITALIA know that there is no such thing as 'Italian food,' and that there is only regional food spread among the 20 diverse regions of the boot. Now, in CIAO ITALIA: MY LIFELONG FOOD ADVENTURES IN ITALY, the beloved author and TV host sets out to keep the soul of Italian regional cooking alive, while giving readers a new appreciation and way of looking at Italy’s rich artisan food culture. 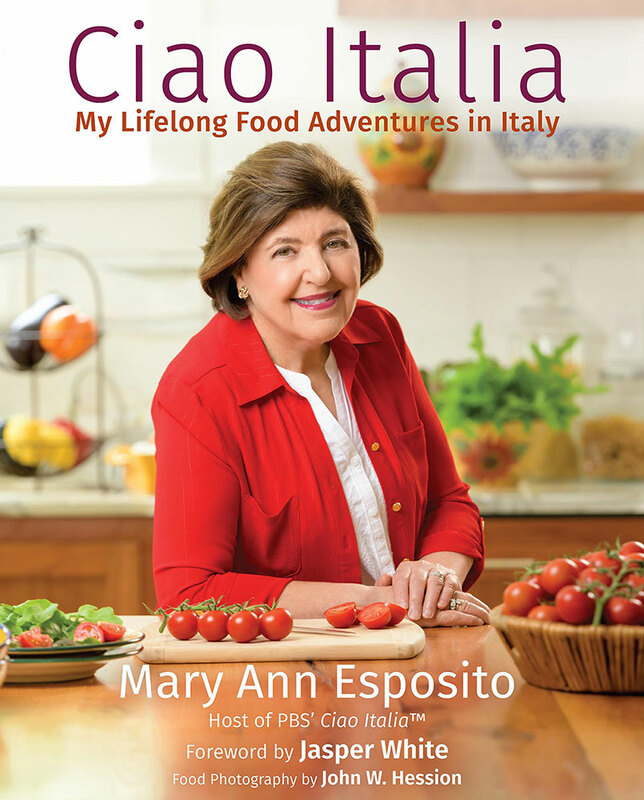 Also part memoir and travelogue, what sets CIAO ITALIA: MY LIFELONG FOOD ADVENTURES IN ITALY apart from other Italian cookbooks is Mary Ann’s constant search for what gives the recipes meaning and how they can be adapted to anyone’s lifestyle and level of cooking skill.